Talking to our daughters about their psychological, emotional, physical and social well-being and growth is crucial as they grow and mature into young women. These conversations help to build a strong sense of self, self-worth and individuality. In light of the plethora of issues that girls of color experience involving their self-love, self-esteem, self-identity, self-respect and self-pride, it is important for mothers, guardians and other family members to talk openly, honestly, and in-depth to their daughters about living life beautiful and the Foundation of Beautiful Elements. Topics will also include guidance, support, nurturing, love, education, bullying, boys, and goals among other topics. 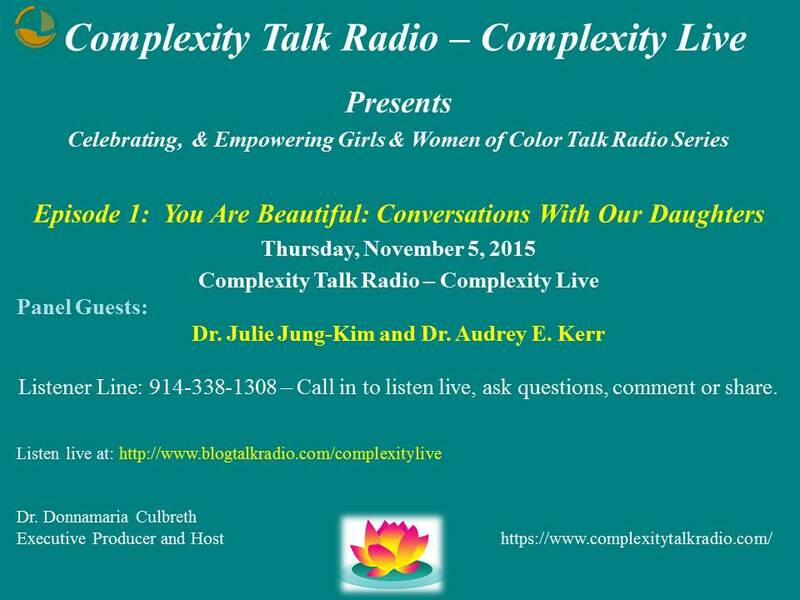 Join Dr. Culbreth, Dr. Julie Jung-Kim and Dr. Audrey E. Kerr for You Are Beautiful: Conversations With Our Daughters. Call in to ask questions, share or comment! Reblogged this on Complexity Talk Radio – Complexity Live.